PRESIDENT Robert Mugabe could lay treason charges against his former deputy, Emmerson Mnangagwa , who slipped out of the country on Tuesday following his expulsion, on allegations of undermining the 93-year-old Zanu PF leader, NewsDay heard yesterday. Stung by Mnangagwa’s statement that he was coming for Mugabe and his family, top government sources yesterday told NewsDay, the former Vice-President could alternatively be charged with conspiracy to overthrow a constitutionally-elected government. The sources said the treason charge emanated from the stinging statement Mnangagwa issued from his new base in South Africa on Wednesday where he threatened to return home in a few weeks’ time to take control of all levers of power from Mugabe. A treason charge attracts a death sentence or life in prison. Mugabe recently indicated that he wanted a rethink on the reintroduction of the death penalty to deal with deviants. Information minister Simon Khaya Moyo yesterday confirmed that various arms of the State were studying Mnangagwa’s statement, saying an announcement on the appropriate action would be made “shortly”. 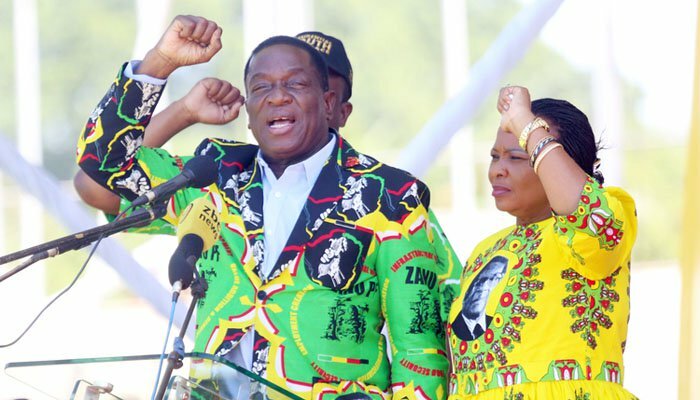 “We have seen the statement from ED Mnangagwa which is being carefully examined and appropriate response and action will be made afterwards,” Khaya Moyo said. On Wednesday, the former Vice-President, who was fired from both government and Zanu PF on allegations of disloyalty, deceitfulness and ineptitude, warned that Mugabe’s days in power were numbered. NewsDay heard that Mugabe was briefed of the statements while chairing an emergency politburo meeting and later directed State security agents to analyse the document with a view to preferring criminal charges against his former deputy. “So far, paragraphs that are treasonous in nature are these; ‘as I leave this post for now I encourage all loyal members of the party to remain in the party to register to vote as we will very soon control the levers of power in our beautiful party and country.’ What does he mean and what are his intentions?” a government source close to the investigations, queried. The sources said Mugabe got angry at being labelled a “self-centred demi-god”. “Yes, the Constitution provides for the freedom of expression, but it does not provide for freedom to insult the President or undermine his authority,” the source said. The other politicians who were accused of treason were former Vice-President Joice Mujuru, former Zanu PF heavyweights Rugare Gumbo, Didymus Mutasa and Nicholas Goche. They were accused of conspiring to overthrow Mugabe in 2014. The quartet is yet to be arrested and formally charged. At one time, MDC-T leader Morgan Tsvangirai had the same charge levelled against him, but was acquitted for lack of evidence. University of Zimbabwe political science lecturer, Eldred Masunungure, however, said that although Mnangagwa’s ouster would weaken Zanu PF ahead of next year’s polls, it would not pose a serious threat to national security. “He is not the first person to be expelled from Zanu PF and from the look of things; his departure has short-term effects. The issue of unity and tribal politics might be topical now but at some stage, due to lack of a clear and vibrant opposition, it will count to nothing,” Masunungure said.